Since the coup on 22 May 2014, about a hundred pro-democracy activists have fled the country. Most were involved in the red-shirt movement. Most decided to flee after they were summoned by the junta. Most also face lèse majesté charges. Seeing the military court handing down severe verdicts in lèse majesté cases with little likelihood of getting bail and no appeals allowed, their chance of walking free in the Kingdom of Thailand is slim and it is no wonder that leaving the country is a better option. But abandoning life, jobs, education, property, and loved ones in Thailand and starting all over in a new country is very difficult. The exiles went to a few destinations in Southeast Asia, Europe, New Zealand and the USA. France is one. In the second of a series, Prachatai’s Thaweeporn Kummetha tells the story of Jaran Ditapichai, a veteran political activist and leftist, who said this is going to be his final exile. Thaweeporn visited Jaran in a city in France he asked not to be revealed and spent some time with him in April along with two other Thai exiles -- Aum Neko, a provocative transgender activist (read the story on Aum), and a former historian from Thammasat University. The following article is written from Thaweeporn’s perspective and you can watch the video interview below. “Comrade Chai” is what Jaran Ditapichai was called during his time in northern Thailand in the late 1970s and early 1980s and he remains proud of this identity. Jaran’s life is full of (red) colour. The 68-year-old activist has been arrested and sent to prison three times for political activism. Following his arrest after the massacre at Thammasat University on 6 October 1976, he escaped from the cells and fled to the northern forests of Nan, where he headed Unit 61 of the Communist Party of Thailand (CPT) and befriended many activists, many of whom have become pro-establishment, yellow-shirt leaders. 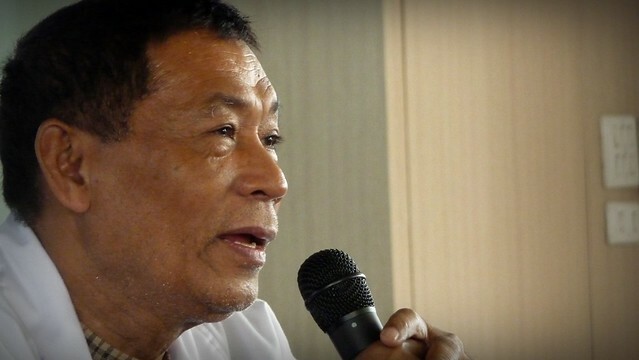 After the decline of communism in Southeast Asia and after the Thai government granted an amnesty for CPT activists, Jaran left the comrade’s life and returned to Bangkok in 1983. He lived in the forest with the CPT for seven years. In Bangkok, he worked for a newspaper for a while before leaving for Paris and training on social movements. After the training ended, he received a scholarship to continue to stay in Paris for postgraduate study. He received his master degree in history from Paris 7 and DEA (first year of PhD) from the Sorbonne. During his study, he worked part-time looking after the elderly and cleaning to support his family who were also living with him in Paris. If most educated Thais like to speak Thai mixed with English, the native of southern province of Pattalung, who was educated in France, likes to speak Thai mixed with French. After five years in France, Jaran returned to Bangkok and taught at Rangsit University and later appointed Assistant Professor. In 1998, Jaran was arrested for the second time when he and 17 other activists bravely distributed leaflets in Yangon to commemorate the 888 student uprising. He was convicted and deported back to Thailand. He also joined the people’s movement against the military dictatorship in 1992. After lecturing at Rangsit University for ten years, Jaran resigned and became a commissioner of the first National Human Rights Commission (NHRC) in 2000. Jaran’s latest round of activism began in 2006 when former Prime Minister Thaksin Shinawatra was overthrown by the coup. 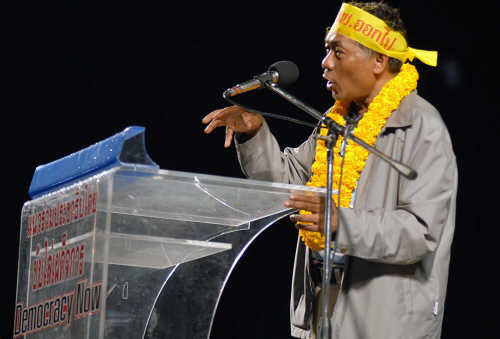 Jaran was among the first who spoke up against the coup and joined other politicians and pro-democracy activists, such as Veera Musikapong, Jatuporn Prompan, Nattawut Saikua and Weng Tojirakarn, in forming the Democratic Alliance Against Dictatorship (DAAD), before it changed into the United Front of Democracy against Dictatorship (UDD), the leading faction of the red shirts. “Activism is in my blood,” said Jaran. He was arrested for the third time after he allegedly led the DAAD supporters to attack the Bangkok residence of Privy Council President Gen Prem Tinsulanonda in 2007. Throughout his activist life, Jaran was no charismatic leader. He does not have fan clubs like Jatuporn and Nattawut nor a prominent leadership role. Jaran is rather persistent and compromising. He has never publicly criticized the CPT or the red shirts or Thaksin. When I asked him to criticize Thaksin and Pheu Thai Party, his answer is we should not have too high expectations of them; they have done their best and we should understand their position. Jaran is indeed a ‘professional’ activist who overlooks problems and differences for the long-term aim, namely the true revolution of Thai society. After the coup on 22 May 2014, the junta’s National Council for Peace and Order (NCPO) issued an order for Jaran to report on 23 May. The police issued an arrest warrant against him on 16 June for not reporting to the military. The police also issued an arrest warrant for Jaran on 26 August on a charge of lèse majesté. His crime? Being the chief organizer of the 40th anniversary celebrations of the 14 October 1973 student uprising, where ‘The Wolf Bride’ was performed in October 2013 at Thammasat University, Bangkok. Two theatre activists were sentenced to two years and a half for their involvement in the alleged lèse majesté play. Jaran quietly crossed the Thai border to a neighbouring country on 27 May before leaving for France in June. Jaran revealed that he has long been prepared for this exile. After the 2006 coup, Jaran foresaw that the democratic forces would someday be crushed again. He applied for visas for several countries and renewed them over and over so that he could easily flee Thailand. 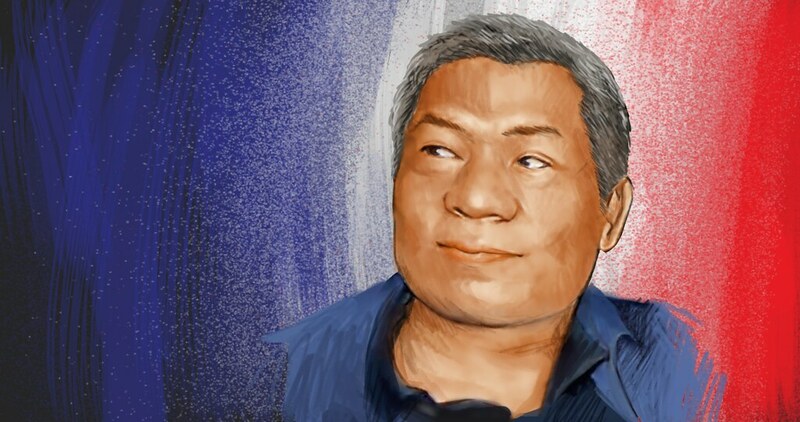 In France, he spent a few months preparing documents, going for interviews and so on, in an application for refugee status, the second Thai after Pridi Banomyong . He claimed to have been granted this in late November 2014, which entitles him to social welfare and housing. Jaran has quickly embraced a new life in France. Apart from spending time editing a new edition of his book on the French Revolution, he found a new role as coordinator of Free Thais for Human Rights and Democracy (FTHD), an anti-junta group in exile, and the coordinator of red-shirt supporters and pro-democracy activists in Europe. In France, Jaran regularly organizes meetings and dinners to unite the red shirts, most of whom are owners of Thai restaurants and shops who do not hesitate to host dinners when Jaran asks. Whenever anyone comes to France to visit the exiles, Jaran would also put the guests in contact with red shirts who are willing to host them for free. The Thai red shirts, most of whom are Prachatai readers and from Isan, hosted dinners to welcome me during my stay in France. I ended up having som tam everyday and for the first time tried the red ants’ eggs, a northeastern Thai specialty, in France. Jaran says his life now is in the same mode as when he fought with the Communist Party. The methods however are different. Instead of using a gun and living an uncomfortable life in the forest, he lives in a city, and uses email, Skype and Facebook in communicating with the world about the problems Thailand is facing. 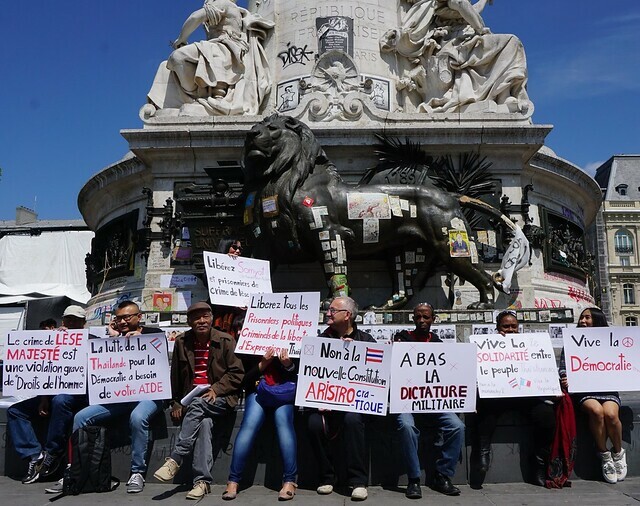 Jaran Ditapichai (third from left) joins the gathering to comemorate rht first anniversary of military coup at Place de la République, Paris, on 22 May 2015. Photo by Din Buadaeng . His daily work is sending email updates to and meeting European governments and international human rights organizations on the political and human rights situation in Thailand, and lobbying them on Thai issues. He also coordinates with the red shirts in Europe and occasionally organizes protests and demonstrations on Thailand. Like Aum, Jaran regularly joins demonstrations in Paris, such as the May Day celebration. The latest gathering he organized was on 22 May 2015. 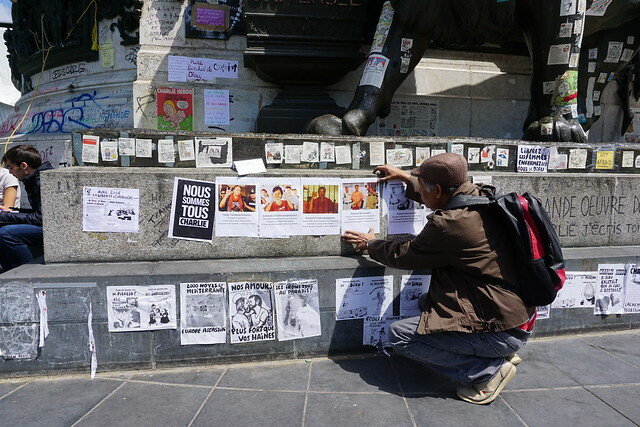 Jaran and about 10 other Thais and French people gathered against the Thai military dictatorship at the Place de la République in Paris. “I feel a bit disappointed with myself on my work outside Thailand,” said the veteran activist. Jaran complained that it is difficult to get the attention of foreign countries and have them take action since the situation is not very serious compared to other countries. Moreover, unlike during the cold war when countries supported political movements in another country because of their political ideology, Jaran said, each country nowadays is more concerned about its trade and military interests. However, his job is to keep the international community informed so that the situation in Thailand will not be forgotten. Asked how the Thai political conflict will end, Jaran said this is going to be the “final fight” of his life because his life is coming to an end. It however will not be the final round of the fight for Thai democracy as the fight will continue. 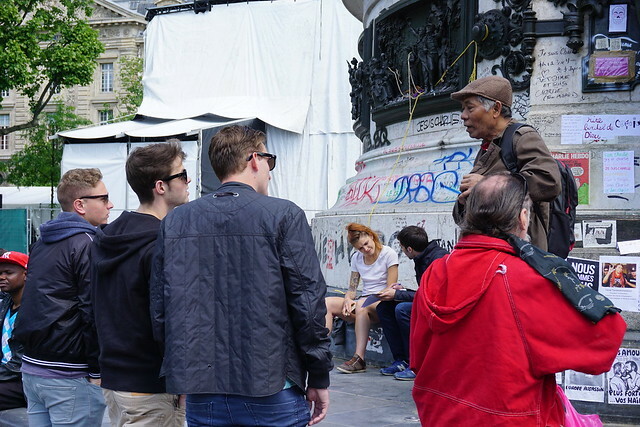 Jaran Ditapichai explains Thailand's political situation to French students who come to observe the gathering at Place de la République, Paris, on 22 May 2015. Photo by Din Buadaeng . Jaran believes the 2014 coup took place to suppress the growing criticism against the monarchy -- the so-called “anti-monarchy trend.” He expects that the junta will stay in power until the succession and after making sure that Thaksin and his cronies will never win an election again. For Thailand to achieve de facto democracy, Jaran said, a revolution is the answer. 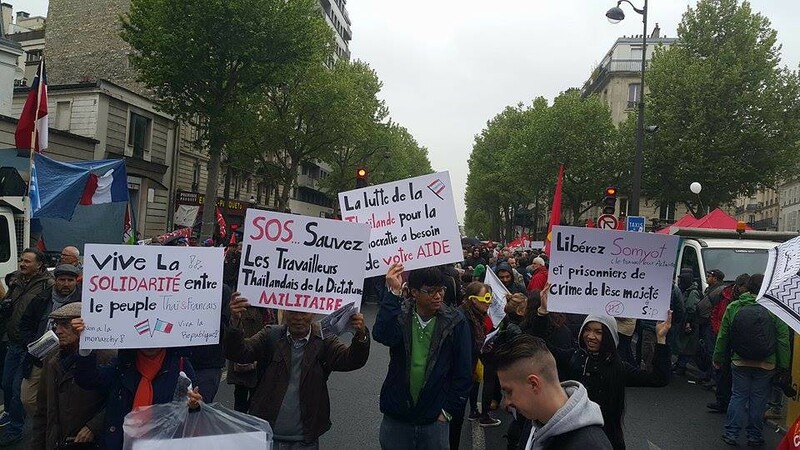 Jaran Ditapichai (second left) and Aum Neko (right) joined the May Day demonstration in Paris on 1 May 2015. Jaran’s placard reads “Save the Thai workers from military dictatorship.” Aum’s placard (in French) reads “Free Somyos (Prueksakasemsuk) and lèse majesté prisoners. On my last night in France, Jaran took me to a leftist bar and told me about his leftist life in the forest like an elder talks about his past to children. I asked why he looks so happy being an exile. Jaran answered that it is because his life has been dedicated to the revolution. “The pleasure of a fighter is to fight and to do things for others. Our happiness is not from material consumption. Even though our fight is defeated, we’re still happy. But we’ll be even happier, if we win”. Unsurprisingly, the happiest moment of his life, Jaran said, was when he fought with the CPT in the forest.